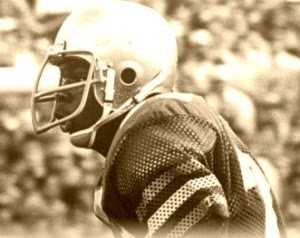 Dave uerson, Notre Dame All-American and NFL All-Pro was found dead yesterday at the age of fifty. After his divorce and forced resignation from the Notre Dame Board of Trustees, Duerson seemingly was getting his life back together and his death comes as a shock to all who remember him, both as a Fighting Irish standout and as one of the many heroes of the 1986 Super Bowl Champion Chicago Bears. At this writing, the cause of death is still pending. FIT asks you to pray for Dave's family as well as for the repose of Duerson's soul.